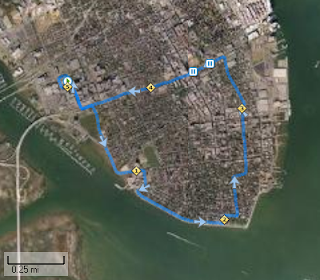 I did a five mile Tempo Run in Downtown Charleston this morning. It was a small group of only five runners. We started with a really slow warm up mile (12:25). My right lower leg has been hurting a little so it was great to have a nice long warm up before we picked it up. My goal was to just stay under 9:00 pace for the next three miles. I was right under (8:55, 8:56, 8:58). I ran with one other runner for most of the tempo section, but her leg started hurting and she dropped back. I never feel conformable leaving people on a group run. I would rather slow down, but we were close to the end and she said to go ahead - so I did. I finished with a cool down mile (9:19) and then slowly circled the gym to finish the run. I thought it was a little cooler today, but I think I am just getting used to the high heat.